Richard ORMSBY (1602 – 1664) was Alex’s 10th great grandfather, one of 2,048 in this generation of the Miner line. Richard Ormsby was born on 28 Jul 1602 in Theddlethorpe All Saints , Lincolnshire, England. His parents were Thomas ORMSBEE and Maria UNDERWOOD. He first married Mary Margaret Masterson on 14 Jun 1622 in England. He came came from the Parish of Ellsworth, Cambridgeshire, England, to York, Maine, in 1638 on the ship “Abigail“. After Mary died, he married Mrs. Sarah UPHAM Wanton 9 Aug 1640 in Saco, Maine. Richard died 10 Jun 1664 in Rehoboth, Mass. Mary Margaret Masterson was born 28 Sep 1603 in Theddlethorpe All Saints, Lincolnshire, England. Mary died in 1639 in Saco, Maine. Sarah Upham was born about 1609 in Salsburg, Lanarkshire, Scotland (Yettington, Devonshire, England) Her parents were Richard UPHAM and Maria [__?__] . She first married [Y__?] Wanton. She second married Richard Webb. 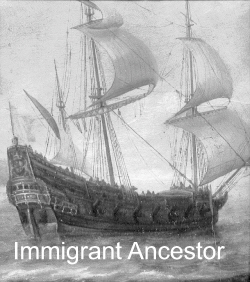 She came in 1635 to Weymouth, Massachusetts, age 26 and single (OR widowed). When Sarah boarded ship on 20 May 1635, she gave her surname as Upham. In her father’s will dated 12 Dec 1635, (he was buried 7 days later), he refers to his daughter as Sarah Uppam. Sarah died after 3 Oct 1665 in Rehoboth, Mass. Sarah came to America as part of the 1635 Hull Company, a large addition to the population of Weymouth. Partial list of the Hull Company from Weymouth in England, but some of them were from other towns in Dorset and in counties near by. 89 Humfrey Shepheard, husbandman, 22 years. 91 Joane Martyn, aged 44 years. 93 John Upham, Junior, aged 7 years. 94 William Grane, aged 12. 95 Sarah Upham, aged 26. 96 Nathaniel Upham, aged 5 years. 97 Elizabeth Upham, aged 3 years. 5 Jan 1663/64 Rehoboth, Mass. 10 Mar 1717/18 Rehoboth, Mass. Last name is sometimes listed as Ormsbee or Ormesby. Richard was a planter by trade. After coming to America, he resided in Saco, Maine in 1640 and probably had arrived there several years earlier. He removed to Salisbury, Mass. about 1645 as a Planter of the Town, and stayed until 1648 when he settled in the adjacent Town of Haverhill, Mass. In 1649, he became a Freeman of the Colony. He finally settled at Rehoboth, Mass. and died there in 1664. The charge of being a witch disrupted the life of Eunice Cole for more than two decades. Richard was a constable in Salisbury in 1656 and testified he saw something on Eunice’s breast when he was about to administer a public whipping. A resident of Hampton in present-day New Hampshire, Mrs. Cole had been in and out of the courts of Essex and Norfolk counties, Massachusetts, since the 1640s. She was tried on charges of witchcraft for the first time in 1656. It is probable that she was convicted, instead of ordering her execution, the court sentenced Mrs. Cole to imprisonment in Boston and a public whipping. She was in and out of prison for the next decade, during which time, in 1662, her aged husband William died. Eunice was charged again with witchcraft in 1673; the court criticized her, though the formal verdict was innocence. In the years before and after this trial she lived in Hampton in a destitute condition. Her third court hearing on charges of witchcraft occurred in 1680; though not indicted, she was put in prison. The depositions from 1673, which are the fullest surviving records of community suspicions, describe Eunice Cole as attempting to persuade a ten-year-old girl, Ann Smith, to live with her. This episode in particular, and Eunice Cole’s life history in general are fully analyzed in John P Demos,Entertaining Satan: Witchcraft and the Culture of Early New England (New York, 1982); another important account that explores the finances of the Cole family is Carol Karlsen’s in The Devil in the Shape of a Woman: Witchcraft in Colonial New England (New York, 1987). The deposition of Richard Ormsby constable of Salisbury. That being about to strip Eunice Cole to be whipped (by the judgment of the court at Salisbury) looking upon her breasts under one of her breasts (I think her left breast) I saw a blue thing like unto a teat hanging downward about three quarters of an inch long not very thick, and having a great suspicion in my mind about it (she being suspected for a witch) [I] desired the court to send some women to look of it and presently hereupon she pulled or scratched it of[f] in a violent manner, and some blood with other moistness did appear clearly to my apprehension and she said it was a sore. John Goddard doth testify that he saw her with her hand violently scratch it away. Sworn in the court at Salisbury. 12th, 2d. month 1656, Thomas Bradbury Vera Copia per me Thomas Bradbury recorder. Sworn in the court September 4, 1656. Edward Rawson affirmed I stood by and saw the constable rip her shift down and saw the place raw and fresh blood where Good[y] Cole [ends abruptly]. The court presently stepping to her saw a place raw with some fresh blood but no appearance of any old sore: Thomas Bradbury recorder in the name of the court. Sworn in court September 4, 1656 Richard Ormsby Edward Rawson Secretary. Also Abraham Perkins and John Redman affirmed on oath that they stood by and saw the constable tear down her shift and saw the place raw and where she had [tore?] of[f?] her teat and fresh blood come from it and saw her [ ] her hand to tear of[f] it was torn off. Sworn in court September 4, 1656 Edward Rawson Secretary. 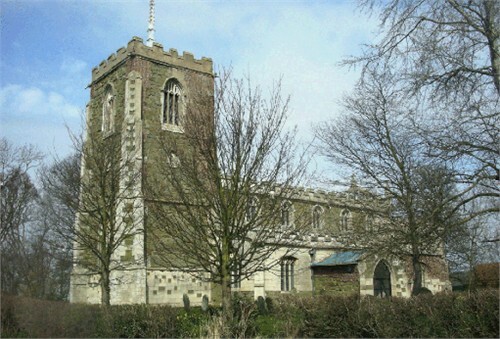 Richard’s father, Thomas Ormsbee (Ormesbie), was born about 1580 in Alford, Lincolnshire, England. He married Maria Underwood on 1 Jul 1602 in Alford. Thomas died in Alford. Richard’s mother, Maria Underwood, was born about 1584 in Alford, England. Maria died in 1661 in Boston, Lincolnshire, England. Probate Records of Rehoboth, Mass. Richard Ormesby’s Inventory presented 3d day, 5th month 1664 amounted to 45 pounds, 14 shillings, 6 pence. It is thought by some that Richard came to America with a brother Jonathan, but the only record of a Jonathan, of the proper time, is in Rehoboth vital records, of deaths, of a Jonathan who died in 1662. Note: Many of the birth places are listed as Lincoln or Lincolnshire. Lincoln is the county seat of Lincolnshire. Richard Ormsby was born in England and came as early as 1641 to Saco, Maine. Thence he removed to Salisbury, Massachusetts. The records show that he was of the town of Salisbury 1645-48, 1652, 1656, 1658-60, and of the adjacent town of Haverhill, Massachusetts, in 1649, 1653, 1662. In 1663 he was living in Rehoboth, Massachusetts, and that year sold land there to Robert Pike (son-in-law of Joseph MOYCE). He was a planter. He died at Rehoboth, and the inventory of his estate idated July 3, 1664. Children: John; Thomas, born November 11, 1645; Jacob, born March 6, 1647-48. Richard came to America from Cambridgeshire, Ellsworth, Parish and landed at York, ME. Prior to 1635, he had a lot near Godfrey. He was a planter in the York settlement on Armenticus Creek (now York River) near Point Bollogne. The settlement, called Gorgeana, later became York. Richard’s first wife probably died about 1639. Prior to 1641, he married Sarah who had come to Saco, ME from London in the late 1630’s. In 1641, Richard was named as an arbiter in a court case, and his residence was stated as Saco. About 1645, he, his wife and their first son, John, moved to Salisbury where he was one of the original planters. Richard took the oath of freeman of Massachusetts Bay Colony in 1649 and several other records indicate that he was in Salisbury and Haverhill until 1662. In 1663 he was in Rehoboth, MA where he sold land to Robert Pike. He died there and his estate inventory was filed on June 30, 1664. Joanna’s husband John Smith was born in 1598 in Newcastle, Stafford, England;. John died 4 Oct 1670 in New London, New London, CT.
i. Sarah Smith, born 1645, Cape Neddick, York, ME; d. 20 Mar 1718, Scotland, York, ME; m. before 1670, York, ME, Robert Junkins. Children: Joseph, Alexander and Daniel. ii. Elizabeth Smith; b. 1630 in Boston, MA; d. 20 Apr 1713 in New London, New London, CT; m. George Way the son of George Way and Elizabeth Smith . Thomas’ wife Mary Fitch was born about 1650 Rehoboth, Mass. Her parents were our ancestors Capt. John FITCH and Mary SUTTON. Mary died after 1716 in Rehoboth, Bristol, Mass. Jacob’s wife Mary Perrin was born Feb 1649, Rehoboth, Bristol, Mass. Her parents were John Perrin and Ann [__?__]. After Jacob died, Mary married (second) at Rehoboth,27 Dec 1677 to Nicholas Ide, born Nov. 1654, died at Attleboro, MA. June 25, 1723, son of Nicholas Ide and Martha Bliss. Nicholas’ grandparents were our ancestors Thomas BLISS (1588 – 1647) and Dorothy WHEATLEY. Mary died 9 Sep 1690 in Rehoboth, Bristol, Mass. Some genealogies incorrectly state that Mary as the daughter of Richard Orsmby instead of his daughter-in-law. Source: Genealogy of the Bliss Family. The Widow Ide had a son Nicholas Ide who is referred to as a son-in-law in Thomas Bliss’ will. Nicholas was b. about 1620 and was a contestant in King Philip’s War. He was m. May 16, 1647 at Springfield, Mass to Martha, whose surname is supposed by some to have been Bliss. She was buried Nov. 3, 1676 at Rehoboth, Mass. To this union was born a son. Lieut. Nicholas Ide, Nov, 1654 at Rehoboth. He was a weaver and married Dec. 27, 1677 at Rehoboth to Mary Ormsby (dau. of Richard Ormsby). Richard Ormsby was b. about 1602 in Lincolnshire, England and m. about 1640 to Sarah [Upham?) Wanton, a widow. Mary Ormsby was buried Sept 9, 1690 at Rehoboth. Their children were born between 1678 and 1693; Nathaniel (who d. Mar. 14, 1702/3), Jacob, Martha (b. Mar. 18, 1682 old style at Rehoboth, m. Nov. 8, 1705 to Zachariah Carpenter (b. July 1, 1680 at Rehoboth and d. there Apr. 18, 1718), and d. at Rehoboth June 17, 1727). Patience, John and Benjamin. Lieut. Nicholas Ide was m. a 2nd time to Eliza, and d. June 5, 1723. Another son, Nicholas Ide, Jr., was b. July 25, 1697 in Attleborough, Mass. This entry was posted in 12th Generation, Historical Church, Immigrant - England, Line - Miner, Public Office, Witch Trials and tagged Rehoboth, The Abigail 1638. Bookmark the permalink. Coat of Arms removed. In reality, Richard Ormsby was not part of the gentry and did not have a coat of arms.